Cioppino recipes are technically an Italian-American dish that originates from fishermen in San Francisco not Italy. 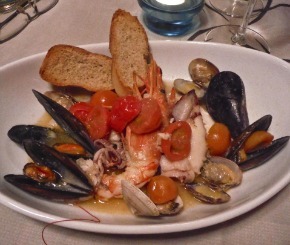 However, Cioppino recipes do resemble seafood stews found in Italy that use many types of seafood. And there are so many different types of seafood that you could use to make this Italian influenced Cioppino recipe. 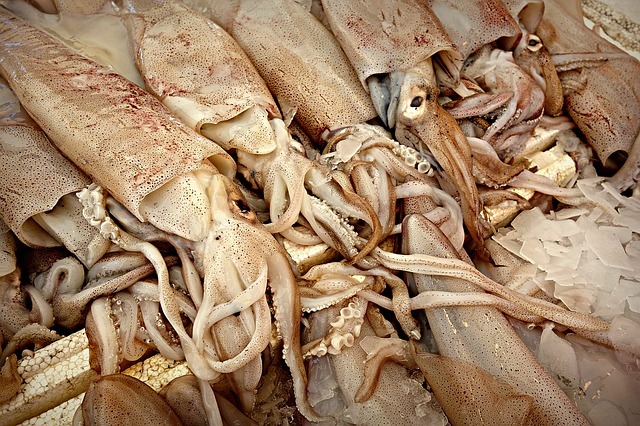 Of course, the best ingredients will always be the freshest seafood that you can buy. And for a really simple seafood recipe, make steamed clams or drunken mussels. Be sure to use seafood that was wild caught as well as caught using sustainable methods for your Cioppino recipes. Add a good amount of olive oil to a large ceramic dutch oven. Then add in the garlic cloves - bring to a medium heat. Then add the onion, fennel, and bell pepper - stir for a minute. Then add the bay leaves and hot pepper - stir for another minute. Then stir in the crushed tomatoes, parsley, basil, and oregano - turn heat to high and bring up to boil. Then add the clams and mussels to the pot. In about another minute or two add the Haddock and shrimp. 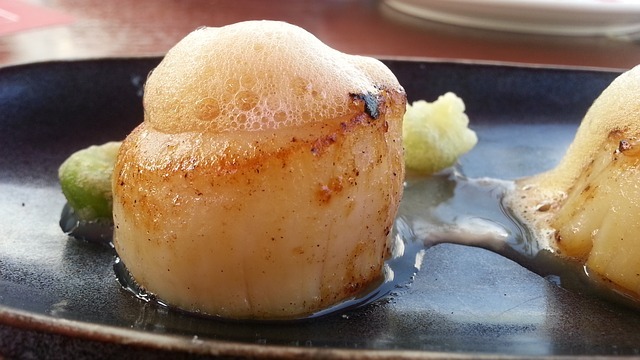 Then add the scallops and calamari to the pot - gently stir. Finish with crab on top and put the lid on pot. Clams and mussels should fully open in a minute or so. Immediately serve in bowls garnished with chopped fresh parsley. 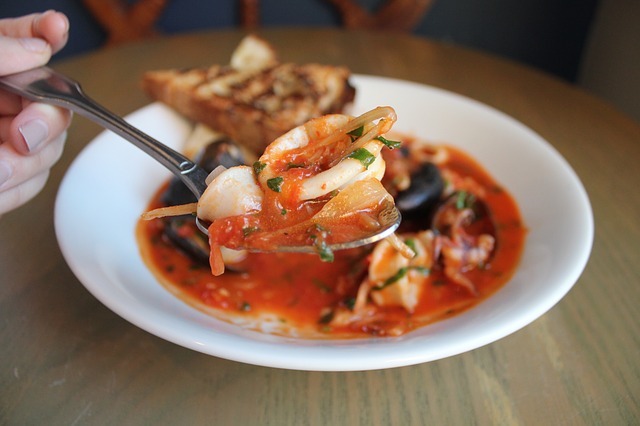 What makes a great tasting Cioppino recipe? Having great tasting seafood that is fresh and wild from the sea! Cioppino recipes can also be made with a tomato based wine flavored broth that uses a really good quality white wine. Enjoy your Cioppino with freshly baked sourdough bread! In a stock pot, saute on medium-low heat the chopped onions and celery for about 7 minutes. Stir in garlic and saute for another minute. Then stir in the white wine and turn up the heat to high. Stir in the bay leaf, oregano, pepper flakes, Worcestershire sauce, tomato sauce, and water (or stock or clam juice). In a few minutes, turn down heat to low - simmer for 35 minutes. Then bring back up to a boil. Stir in the lemon slices and white fish - cook for a couple minutes. Next, stir in lightly steamed crab and raw shrimp. Finally, add in the mussels and be sure to submerge completely. Cover pot with a lid and boil for 5 minutes or until the mussels completely open up. Stir in fresh herbs and season to taste. Remove from heat and serve! I like her technique for storing clams in the refrigerator. She rinses clams with cold water and puts them in between two damp dish towels on a tray. This keeps them alive in the refrigerator. Making seafood recipes can include a wide variety of seafood and you can make your recipe as complicated or as simple as you want. Saute the garlic and tarragon in a hot skillet with olive oil for a couple of minutes. Then add the clams to the pan and cover with a lid. Steam for 5 minutes (for room-temp clams) or 10 minutes (for cold clams). As the clams open up, remove them from the skillet. Then add into the skillet red pepper flakes, chives, lime zest, lime juice, and butter - stir until melted. Then spoon the herb sauce over the opened clams. 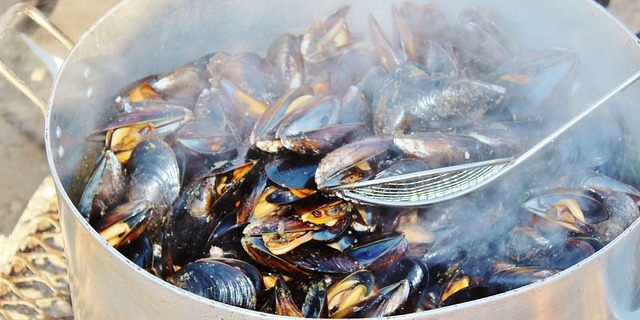 Be sure to clean your mussels and clams before cooking them in your seafood recipes. And remember to discard the mollusks that are open before they are cooked and to discard the mollusks that do not open when steamed. It's very important that mussels and clams are allowed to breath when you store them in your refrigerator - never store them in a closed plastic bag or they will die and open. Also, support your local fishermen and women who are working hard to supply you with the best quality seafood. Heat a stock pot to medium heat and melt the butter. Add the garlic and saute for 30 seconds. Then add the red pepper (saute 15 seconds) and lemon zest (saute for 30 more seconds). Then pour in the wine and season with pepper. Put the lid on and turn the heat to high. Remove lid when broth starts to boil and throw in your mussels. Then put the lid back on and cook for 1 minute. After 1 minute, remove lid and give the mussels a stir. Put lid back on and cook for 2 more minutes. Remove the lid once more and add the parsley - stir. Put lid back on and cook for 1 to 3 minutes longer or until almost all of the mussels have opened up. Serve mussels in bowls drenched with the tasty broth.